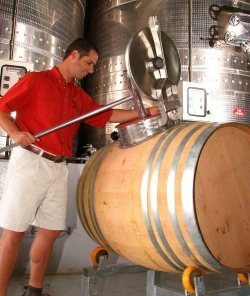 In an age of automation, Fairview winery in South Africa has implemented a “roto-barrel” system that they say will increase the winemakers’ involvement in the wine production. Large, stainless steel roto-tanks for fermentation are a familiar sight in big volume wineries, but Fairview winemaker Erlank Erasmus has transformed this concept to a smaller, more handcrafted format. A small “manhole” has been installed in a number of 500-litre French oak barrels, which are housed on specially produced cradles incorporating a set of castors, allowing the barrels to be rotated. The rotation allows the grape skins and juice to be thoroughly macerated. 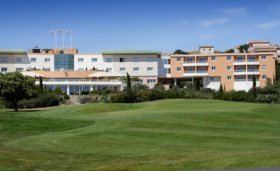 Erasmus says “Being a sealed system ensures better hygiene, while alleviating issues around volatile acidity and oxidation. Another advantage is that it allows the winemaker to leave the wine on the skins for longer, inside the sealed unit.” This system has been used for some of the fruit for Fairview’s Single Vineyard Shiraz wine Beacon, Jakkelsfontein and Solitude 2007. 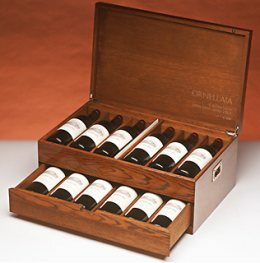 The “Millennium Collection,” a selection of four vintages of the famous superTuscan Ornellaia presented in a wooden chest, sold out immediately when it was released. 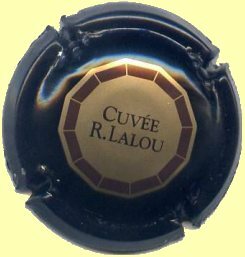 That success is to be repeated with a “treasure chest” offer consisting of the much vaunted 2001 (now almost impossible to find in the market), and the 2002, 2003, and newly released 2004. The hand-carved, solid oak case contains 12 bottles, three of each vintage, and only 600 will be available. Both case and bottles are individually numbered. The cases will be distributed by John Armit. Contact +44 (0)207 9080600, or email info@armit.co.uk. Carefully slice the ciabatta lengthways into long, thin slices. Brush the slices with olive oil, and rub with a clove of garlic. Chop the tomatoes and simmer for 15 minutes, then sieve to remove seeds and skin. Spread the tomato base onto the ciabatta, and then top the bruschetta with the other ingredients. Top with slices of manchego and herbs and bake in a medium oven for 15-20 minutes. 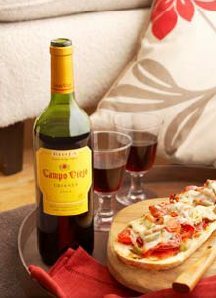 Campo Viejo Crianza 2004 is available from Waitrose, Tesco, Sainsbury’s, Oddbins, Asda, Costco, Morrisons and Threshers. Many of us enjoy picking up a good bottle at one of the many World Duty Free stores in airports around the UK. 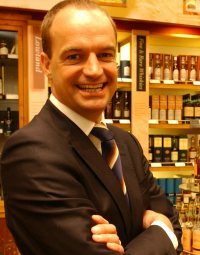 Fraser Dunlop has joined airport retailer as head of category for liquor, tobacco, food and Tax Free items. Fraser is now responsible for the development and management of all his category products sold in all World Duty shops in BAA airports. Formerly the Category Manager for Beers, Spirits & Tobacco within J. Sainsbury’s, Fraser has had a varied career in many buying roles, inlcuding his early years on the island of Islay, famous for its malt whisky. He is said to have a “long-held passion for quality drinks,” and will be using this knowledge to secure exciting product exclusives for World Duty Free. Viña Ventisquero is the first winery in Chile with a certification to offset its CO2 emissions. The company has teamed up with UK-based Climate Care, specialists in reducing greenhouse gas emissions on behalf of companies and individuals. Climate Care calculated the direct fossil fuels emissions of Ventisquero’s main business activities to quantify the amount of emissions produced by the company. Export Manager Américo Hernández explains, “The audit on our business activities and emissions related to wine production showed that transportation to the UK released the most CO2 – almost two tons per 40ft container – so this was the first area we targeted.” A Climate Care sticker on each bottle of wine will bear witness to the company’s commitment to the environment, which forms a key part of the winery’s mission. The awards ceremony for the English & Welsh Wine of the Year Competition 2007 took place at the end of July. 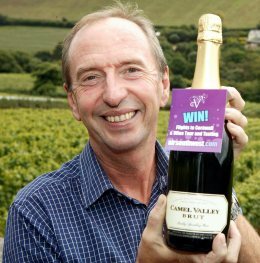 The judges – all Masters of Wine – awarded 8 gold medals, 13 silver and 61 bronze.The trophy for ‘Wine of the Year’ went to Camel Valley Vineyard for their sparkling rosé, ‘Cornwall’ Pinot Noir 2004, which also gained the trophy for Best Sparkling Wine.Chapel Down won two trophies for their Bacchus Reserve 2005 – Best Wine of Other Year’s Vintage and Best Single Varietal Wine. Best Red Wine was awarded to a single varietal 2004 Pinot Noir from Sandhurst Vineyard.